|PIC1|Raipur – Christian leaders in Chattisgarh have organized a five-day rally to protest against the rise in acts of violence committed against the church and have urged the local political leaders to arrest those responsible for anti-communal activities. On September 11, some unidentified Hindu extremists attacked two churches in Raipur – the Teacher Disciple Vineyard Church and the Christian Evangelist Assembly Full Gospel Church - destroying church properties and assaulting worshippers – acts that were strongly condemned by the Christian community. 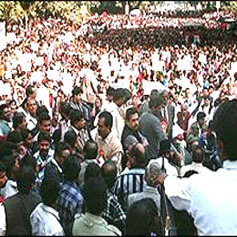 To protest against the attack, about 80 Christian leaders attended the rally, coordinated by Arun Pannalal of the Church of North India (CNI) while a delegation from the Raipur Fellowship, an association of local pastors, submitted a memorandum of protest to the state home minister Ram Vichar Netam on September 16. According to news sources, the memorandum demanded the prompt arrest of the accused in the two recent attacks on churches, provision of proper protection and adequate security for the churches and the worshippers, inquiry into the numerous incidents of anti-Christian violence that have taken place and a ban on religious fundamentalist organizations. “While receiving the memorandum, the minister asked us to stop the protest rally and assured us that he would promptly look into our demands,” Compass Direct quoted Rakesh Jayaraj, a member of the delegation, as saying. Initial inquiry has revealed that members of the Hindu extremist outfit, the Dharma Sena (Army of Religion) – formed by Dilip Singh Judeo, a local political leader of the Hindu nationalist Bharatiya Janata Party (BJP) who revived the anti-Christian movement within the state, and backed by the Hindu right-wing party, the Vishwa Hindu Parishad (VHP or World Hindu Council) – were behind the attacks. According to Jayaraj, the Dharma Sena activists stormed into the Teacher Disciple Vineyard Church in Jagannath Nagar, Raipur, on the morning of September 11, while it was still under construction and went on a rampage, desecrating the cross and breaking chairs, a gas cylinder and a water pump. This was the second attack within a month as on August 14, fifty extremists belonging to the same group had attacked the church, demolishing the boundary wall and the cross, on grounds that the church had encroached on land belonging to one of their leaders, Sandeep Tiwari. Several church officials have filed official criminal complaints against some members of the Dharma Sena, including its local president and the court has passed an order that nobody should enter the church premises, while the issue was pending. The Christian Evangelist Assembly Full Gospel Church in Raipur came under attack while a worship service was going on. “When my wife and my brother went out to see why there was a loud noise outside the church, the miscreants attacked, punched and slapped them, accusing the church of conversions,” he said. According to news reports, on September 17, members of the VHP, the Forum for Religious Revival and the Dharma Sena held a counter-rally, alleging that 47 churches in Raipur were built on land belonging to Hindus. However, Christian leaders have dismissed such claims as false but are tense as they fear that it would give rise to more religious persecution within the state. Chattisgarh is one of the strongholds of the Hindu fundamentalist outfits in India. Anti-conversion laws are presently in force in the states of Orissa, Madhya Pradesh, Chattisgarh, and Arunachal Pradesh. Gujarat state passed a similar law in March 2003; but the law has not been enforced because the government has not yet formulated rules under the Act. Tamil Nadu was another state that enacted the anti-conversion law in October 2002. However, the state government scrapped it following the defeat of the Hindu nationalist Bharatiya Janata Party (BJP) in the 2004 Lok Sabha elections. The state of Chattisgarh was created in November 2000, splitting it from Madhya Pradesh and it has continued to retain the Freedom of Religion Act adopted by Madhya Pradesh in 1968.